The easiest answers always seem to be the most difficult, as well. I’m talking Ikea closet organizers everywhere with no clue how to read the Swedish instructions or budget commercial wood closets that come “ready-to-assemble” -- yeah, sure they do. Recently, I’ve been really intrigued by the environmentally-friendly products because I want it to look beautiful, but let’s make it eco-safe. There’s a new product on the market that I’ve been looking into and it not only looks exactly like wood but it’s eco-friendly and inexpensive. This new product that’s checking off all the boxes is called melamine and its 100% recycled products that replicate wood. The melamine closet organizers are going to be the next big thing; I’m calling it now. They are thick and durable and look exactly like wood but for significantly less. This modern white melamine walk-in closet is vamped up with some trendy accessories. The bullnose drawer faces, insert doors, and melamine molding add something to the look of the closet. Incorporate some chic drawer handles and shelves for shoe layout to finish off the perfect affordable walk-in. This gorgeous closet is made of ivory melamine and has a touch of walnut glaze finish. The Birch countertop is matched with chic hardware. The Cape Cod feel makes this closet undeniably one of the best looking rooms in the house. This is a bit different from your normal closet. The walk-through design utilizes the space with shelves and a drawer set made of the melamine product. This has more of an executive feel but it comes in different wood, textures, and color finishes to express any man's true style. 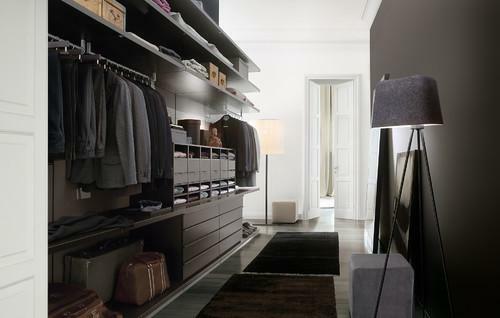 The slant-ceiling design can be a bit of a challenge but with the right closet organizer, you can utilize the space. Let this roofline closet be your inspiration. The melamine countertop and shelves create functional tops for storage. On the other side, hanging rods make the most of the angled space. This stunning walk-in closet incorporates a melamine island as well as drawers and shelving on both sides. The custom lighting and carpet flooring complement the traditional design. This melamine closet design creates a beautiful space that takes any master bedroom to the next level. Now that you've seen these design inspo photos, look into adding melamine to your closet renovation. It’s not only eco-friendly but also wallet-friendly -- they are speaking my language!